XC Bragg Creek Biathlon Programs will run in the West Bragg Creek public lands area on Sunday mornings & Tuesday evenings. Skate ski gear is required. A parent or responsible adult must be available on a rotational schedule to set up and take down the rifles, targets, mats and rifle blocks. This XCBC Biathlon program is in its first trial year. Coaches will be certified Biathlon coaches. The program is an entry level Biathlon program for approx ages 9-13 new to either Biathlon and/or skate skiing. The Eco-Aim camera rifles are a great training tool with a built in computer system allowing coaches to view the athletes sight target and breathing rhythms while also calculating timing and results. Training will include range safety protocol and all Eco-Aim rifles will be treated just as any projectile rifle would be treated. Athletes will be invited to attend and compete in local Kinder Cups. These are fun entry level Biathlon races. Eco-Aim rifles will be used for XCBC Biathlon athletes. 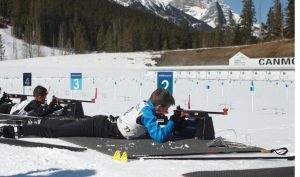 Other regional Biathlon athletes will use their specific program rifles such as air rifles where appropriate. Kinder Cup registration only requires a $10 recreational Biathlon Canada Membership (please see below). It is mandatory for all XCBC Biathlon athletes and coaches to have a Biathlon Canada Membership. Information on class days and times. Costs for season with Learn to Train. skate skis that are appropriate for your weight ( please have the camber checked at a reputable ski store for weight) and height (tops curve over the head or longer). skate poles- pole top/handle straps should be between chin and nose. Straps should be adjusted so hands are close to the pole. skate ski boots that fit well. No lift or rubbing in the heel area. A way to snug them up tightly ie) laces or pull tie. appropriate ski socks (no cotton)-You can again use the 3 Ws; wicking, warm, then your boots are the wind layer. It’s better to have two thin socks than one pair of bulky thick socks. If your feet are prone to getting cold, then get a ‘boot warmer’. (It’s a layer you put over your boots that are designed for ski boots and bindings). For kids- a large wool sock over their boot, (with the appropriate holes cut in it to accommodate bindings) will suffice as a boot warmer. mitts are warmer than gloves (no cotton). Again, for colder days, layering mitts are a good idea. Some little fleece mittens work well inside a x-country ski mitten for cold days. Instant hand warmers (‘hot shots’) are good if your hands get really cold. Skate skis must also be glide waxed regularly. This helps them glide. Please see “events” calendar for all scheduled program sessions. Please see “events” calendar for all scheduled program sessions, events and other scheduled XCBC activities. Biathlon athletes will be invited to attend KinderCup events in the local area. Q: If a session is cancelled? A: An email and/or website post will be sent out by noon the day of. When you really think about it, this is almost the “ideal” program in so many ways. It is local and convenient. It is a “no stress” introduction to a sport that promotes fitness and health for life. It offers competitive opportunities to those who so desire. Finally it happens in a beautiful outdoor environment. I believe there are many sports clubs who seek to fulfill one of these goals, but very few who attempt to fulfill all of them. We are so fortunate to have XCBC in our backyard! Let me say something. You have an amazing team with awesome support. They really helped me this weekend. This is what I call an “extra mile” in customer relationship. So I give 8 stars for the program theme and if I could, I’d give 10 stars for support.